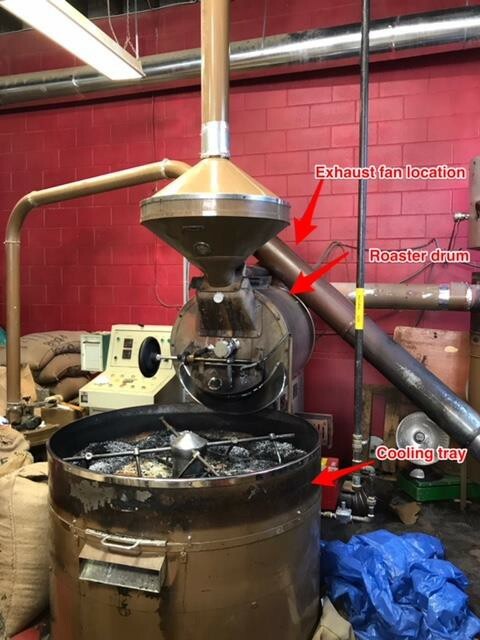 A commercial coffee roaster caught fire during operation due to a failed exhaust fan and air-proving switch, resulting in damage to the roaster and building. A coffee roaster roasts beans inside a large rotating drum that is heated by a gas-fired power burner. The heat and products of combustion are drawn through the drum via an exhaust fan. 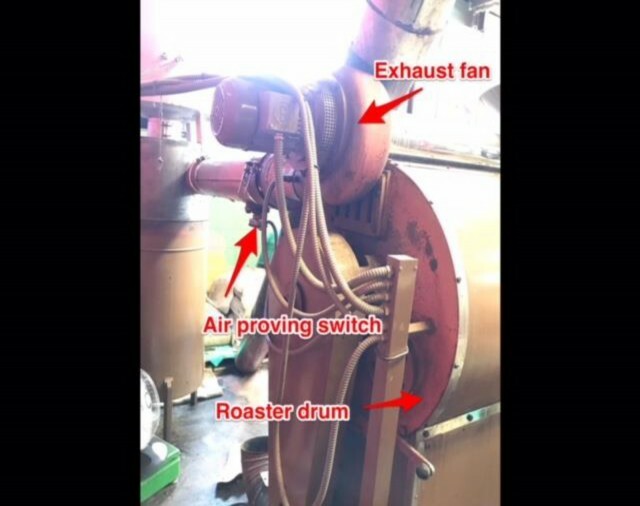 The exhaust fan plays a critical role in maintaining safe operation of the roaster. The air flow from the exhaust fan removes products of combustion safely to the outside and ensures that the beans do not overheat. The roaster burner is interlocked with an air-proving switch that ensures the roaster exhaust fan is functioning and drawing air through the drum. The air-proving switch is a mechanical device that completes an electrical circuit when it is subject to sufficient air flow. In normal operation if the exhaust fan fails, the air-proving switch will safely shut down the burner and ensure the beans do not overheat. When the roast cycle is finished the beans are released into a cooling tray where an inducing fan rapidly draws air through the beans, quenching the heat and releasing smoke to the outside. During a roast cycle the roaster operator briefly left the room where the roaster was contained. When he returned to the room the operator found a large volume of smoke coming from the roasting drum. The operator noticed that the exhaust fan was not running. 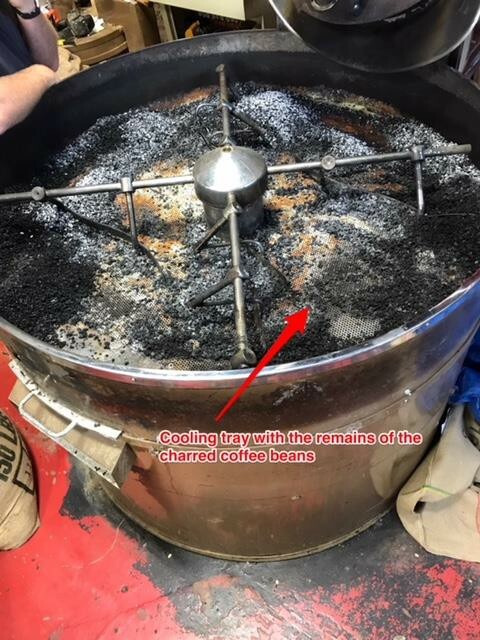 The operator released the beans into the cooling tray where the airflow (oxygen) generated from the inducing fan fueled the smoldering beans, resulting in a large fire that damaged the coffee roaster and the roof of the building. The operator attempted to extinguish the fire but was unable to contain it. The fire department attended the scene and extinguished the fire. 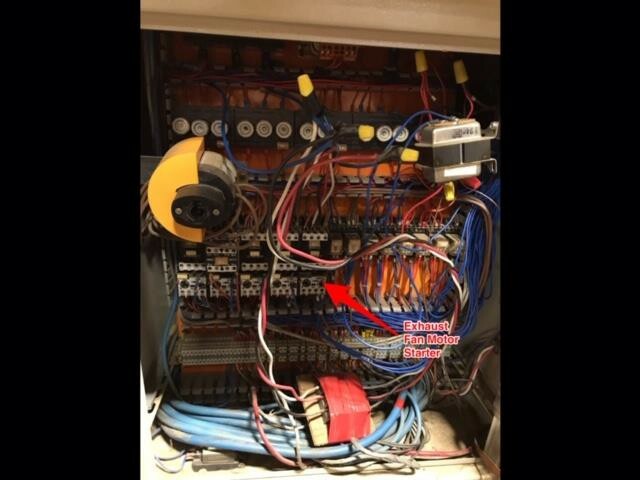 The operator stated that when he saw the smoke coming from the roaster he noticed that the exhaust fan was not running. 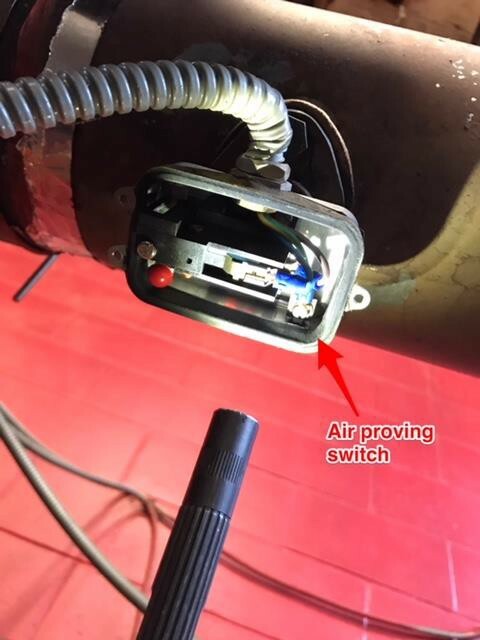 During investigation it was found that the air-proving switch had failed in the closed position, rendering it ineffective in sensing exhaust air flow. 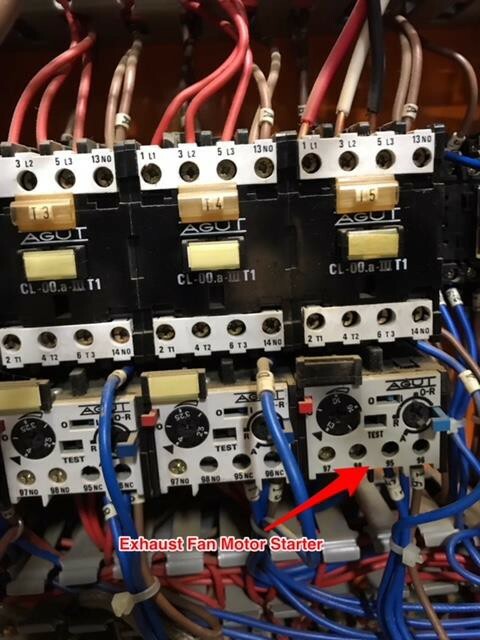 It was determined that the motor-starter coil that controls the exhaust fan had failed, cutting power to the exhaust fan mid roast. 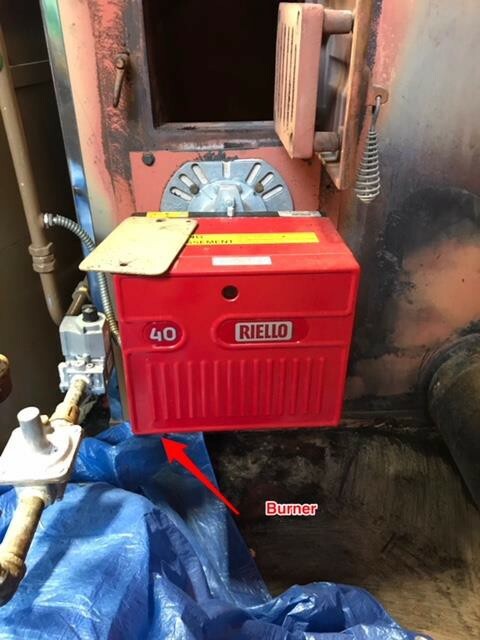 Because the air-proving switch had failed, the roaster burner continued to run without the exhaust fan, overheating the beans until they caught fire. When the operator released the beans into the cooling tray the large volume of air introduced to the smoldering beans from the inducing fan resulted in a large fire. It is highly probable that the combination of a failed air-proving switch and a failed exhaust fan motor-starter caused the roaster fire. Because the beans were released into the cooling tray they were fueled with sufficient oxygen to produce a large, uncontrolled fire. Damage description: Minor damage to roof of building. Extensive damage to coffee roaster.